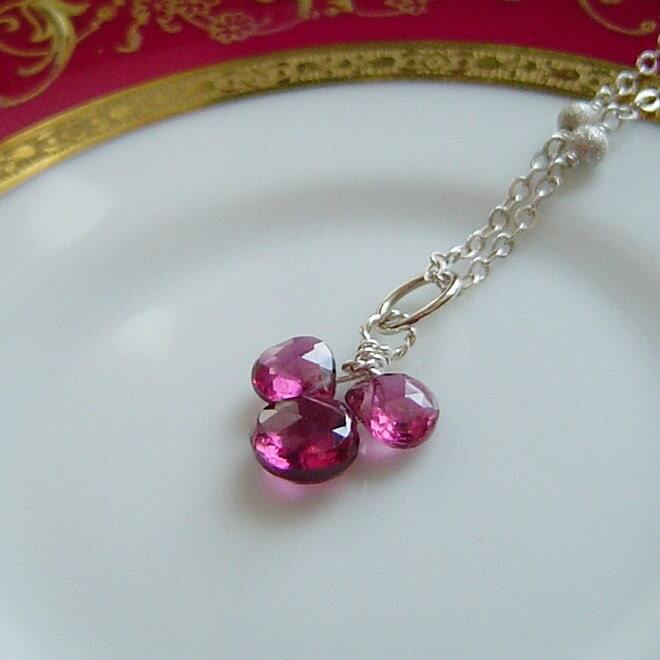 Three Plum Garnet briolettes have been combined to create what I call Plum Orchid. They are small but they are gorgeous! Wrapped in 14k WHITE Gold. 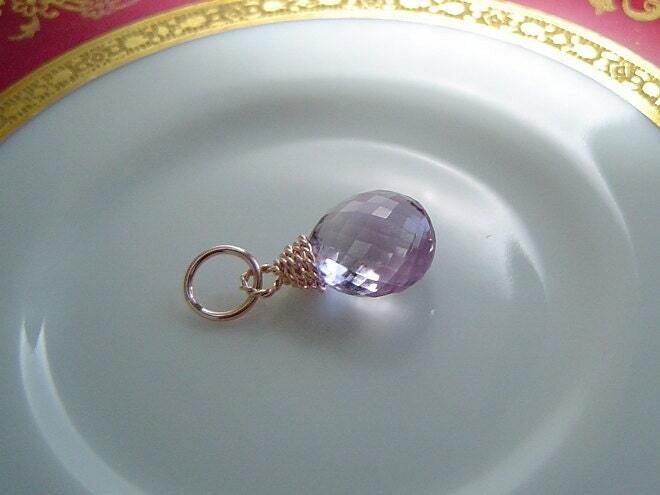 Pink Amethyst full cut briolette is heart shaped and fabulously faceted. Stone has been carefully wrapped in 14K White Gold Filled wire and hung from handmade bail of the same, the bail has an inside measurement of approx 5.5mm. Pendant Size – 3/4″ x 1/2″ approx. You shine where ever you go . . . . 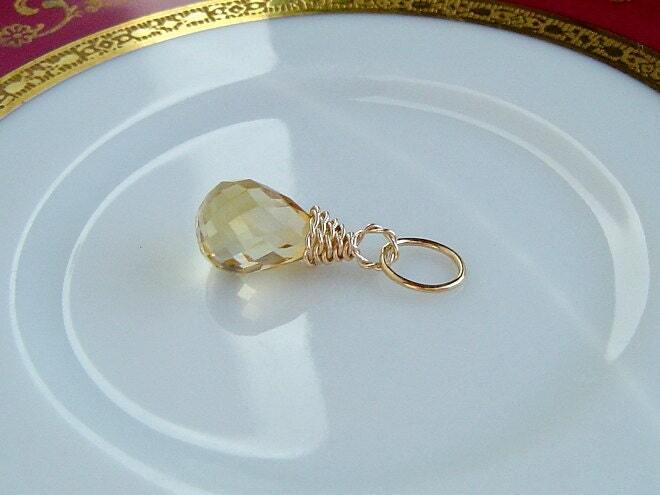 Bright and sparkly, this lovely Citrine Briolette is carefully wrapped in 14K Gold Filled Twisted Wire and hangs from a 14K Gold Filled bail; interior of bail measures 5 x 6 mm. Hang this bit of sunshine from your own chain or one of mine – find them in the shop. 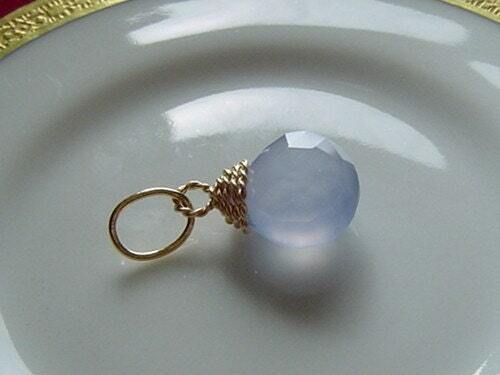 All natural – Fabulous slice of Blue Lace Agate with golden quartz top – reminds one of a sandy beach and ocean waves. It is finished by a twisted wire cap of 14K Gold Fill and a bail of the same; interior of bail measures 5 x 6mm. Limited Edition. Pendant measures 1 1/4″ long (including the bail) by 3/4″ wide. 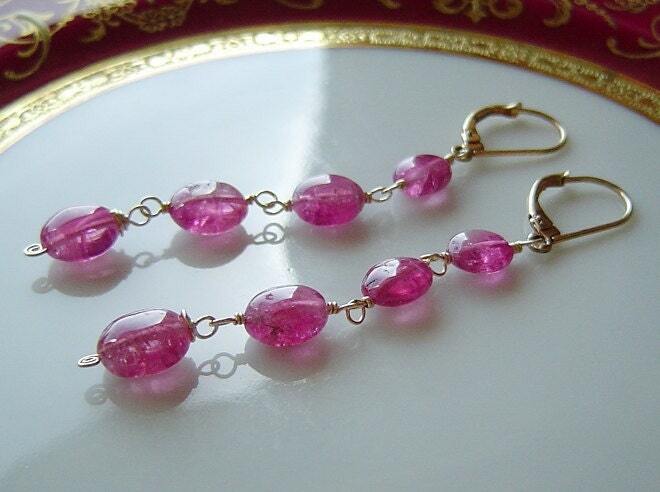 A Grade Pink Tourmaline Ovals are carefully wrapped in 14K Gold Filled wire to create these modern yet classic earrings. 14K Gold Filled Leverback Earwires. Total Gem Weight: 14.22 carats WOW! AAA Large & Lovely Lemon Quartz Briolette Hearts are wrapped in 14K Gold Filled wire and hung from bails of the same; inside bail measures 5 x 6mm approx. Find 14K Gold Filled Swan French Earring Hooks, available separately. 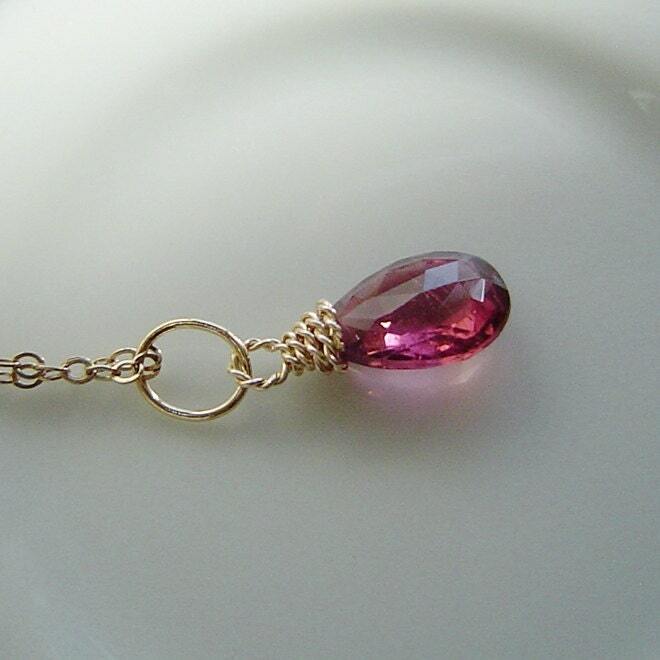 AAA Magenta Pink Tourmaline briolette is carefully wrapped in 14K Gold Filled wire and hung from a bail of the same; inside bail measures 5 x 6mm. It comes with a 14K Gold Filled fine cable chain measuring 18″ (will shorten by request). Pink Amethyst Briolette is carefully wrapped in 14K ROSE Gold Filled wire and hung from a handmade bail of the same; inside bail measures approx. 5mm. Chain available separately. 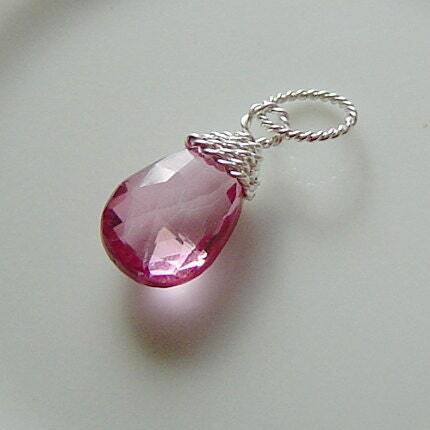 AAA Pink Topaz briolette is shown carefully wrapped with .999 Fine Silver Wire and hung from a sterling silver bail in photos 1, 2, & 3. Last 2 photos show stone wrapped in 14K Gold Fill and hung from the bail of the same. You choose which color wrap in the “message to seller” box at checkout. What to do with all those tomatoes . . .
Lovely Gift for the Bride . . .
RIP Prince ~ It’s been 6 days and I’m Still cryin . . .
from the designer . 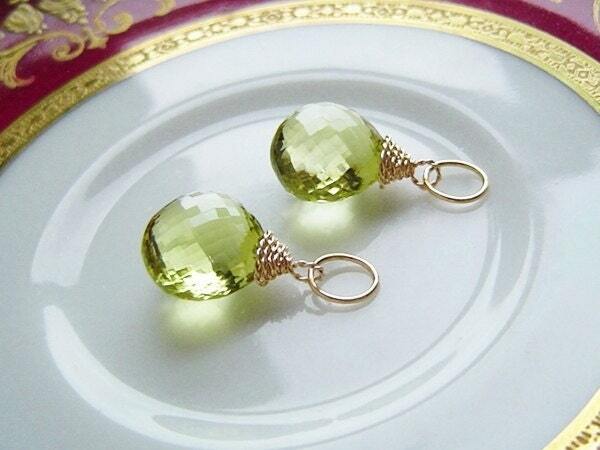 . .
"I love creating personalized, meaningful jewelry with precious metals and gemstones. . . telling stories one at a time. What story do you want to tell?" When the tomatoes start ripening, I always end up with more than I can eat!!! Here are the few of the ways I process my tomato harvest: READY TO EAT? Get Your Sparklers at the Queeniejewels 4th of July Sale! Gorgeous Heirloom Glass Locket is made of Gold on Stainless Steel - best quality in lockets. It opens with a screw top to securely hold your gems. Diana Bostany Jewelry shared Kelcey Carlson's photo. Gov Mark Dayton has asked MnDOT to light the I-35W bridge in rainbow colors until June 16 to honor Orlando victims.